Only seats for “spectators” available: Participants will learn the programming and electronics involved in animating mechanical objects using realtime MIDI control and sequencing techniques. By examining physical examples of instruments and artwork, the seminar will explore a practical approach to constructing mechanical musical instruments and animatronic puppets as well as various programming strategies. 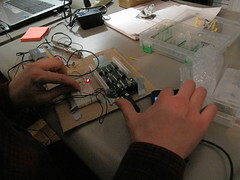 Participants will learn the programming and electronics involved in animating mechanical objects using realtime MIDI control and sequencing techniques. By examining physical examples of instruments and artwork, the seminar will explore a practical approach to constructing mechanical musical instruments and animatronic puppets as well as various programming strategies. 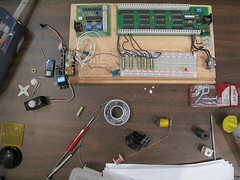 Participants will learn basic MIDI programming/recording, electrical and silver soldering, and basic electronics utilizing power transistors and relays. They will be exposed to a variety of mechanisms and actuators, AC/DC solenoids, motors, and lights as well as the functionality of the MTP-7 and the SRV-4. The MTP-7 is a pre-assembled board that allows the real-time MIDI control of multiple switched voltage outputs utilizing MIDI on/off note messages and velocity. 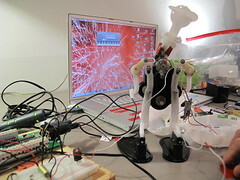 The SRV-4 is used to control servos with realtime midi expression. These will be the main interfaces between the computer and the mechanisms we will be manipulating. By using MIDI, participants will learn techniques to perform and record movements as well the plotting of movements over a piano-roll-like timeline on the computer. 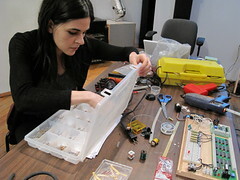 The main focus of this class will be to build mechanical musical devices which will be programed to be installed in a gallery or to perform with in live musical or theatrical pieces. 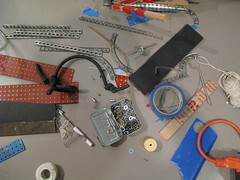 MIDI Recording and Programming Techniques for Mechanical Music and Animatronics, MIDI Pulse Width Modulation, Utilizing Program Change and Velocity, Synchronizing Motors and Lights with Sound/Music, Eliminating the “Clank”, Compensating for Mechanical Delay, Designing and Winding Silent Solenoids. After the participants learn the basic electronic circuits involved in this process and how to use the MTP-7 board, their future electromechanical works can be furthered, combining Max or PD, Micro-controllers, and other MIDI applications. The price of this unit is £63.00 (UK Pounds), including installation instructions and technical support by e-mail/telephone. 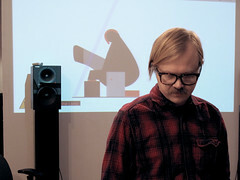 Matthew Steinke is a musician, instrument maker, visual artist and animator. He studied analogue electronics & audio engineering at the Evergreen State College in Olympia, Wa. While in the NW he started the experimental rock band Mocket, the post-wave Satisfact, and the first installment of Octant, his ongoing solo project comprised of hand-built, mechanically driven instruments. He then moved to Chicago to receive his MFA from The School of the Art Institute of Chicago, where he was awarded a scholarship to produce robotic sculpture in the Art and Technology department. He was subsequently awarded the Illinois Arts Council Artist Fellowship in New Media. Currently residing in Brooklyn, he divides his time between teaching Digital Media, building instruments and performing with the latest version of his robotic band, Octant.